Democratic Rep. Debbie Wasserman Schultz of Florida is introducing a pair of amendments Thursday into a 2018 appropriations bill aimed at stripping White House senior adviser Jared Kushner of his security clearance. The amendments come as Kushner finds himself under renewed scrutiny after his participation in a June 2016 meeting that involved Donald Trump Jr. and a Russian lawyer in Trump Tower was revealed. 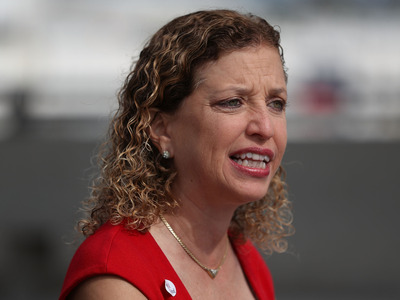 Wasserman Schultz’s amendments, which on the surface would seem unlikely to be adopted into the bill by the Republican-controlled Appropriations Committee, will be voted on immediately after their introduction Thursday. The text of the amendments was provided to Business Insider. “None of the funds made available in this Act may be used to issue, renew, or maintain a security clearance for any individual in a position in the Executive Office of the President who is under a criminal investigation by a federal law enforcement agency for aiding a foreign government,” the first amendment read. “None of the funds made available in this Act may be used to issue, renew, or maintain a security clearance for any individual in a position in the Executive Office of the President who deliberately fails, as determined by the issuing department or agency, to disclose in the Standard Form 86 [the security clearance form] of such individual a meeting with a foreign national if such disclosure is required for such form,” read the second. Kushner is the only current White House staffer who was present for the meeting with the Kremlin-connected lawyer, Natalia Veselnitskaya. Emails released Tuesday showed Trump Jr. was promised dirt on Hillary Clinton that he claimed was never actually presented. Trump Jr. posted emails that were forwarded to Kushner and Trump’s campaign chairman at the time, Paul Manafort, setting up that meeting. Democrats and Republicans have subsequently questioned why Kushner still has a security clearance. The deputy White House press secretary, Sarah Huckabee Sanders, did not tell reporters at Wednesday’s off-camera briefing whether Kushner still held that clearance, saying Democrats “are trying to play political games” by calling for it to be revoked. It’s not the first time Kushner’s security clearance has come under question. Kushner had to revise his security clearance form after he failed to disclose meetings with the Russian ambassador to the US and a Russian banker, which led to The New York Times‘ discovery of the Trump Tower meeting involving Trump Jr., Kushner, Manafort, and the Russian lawyer. Additionally, the House and Senate intelligence committees and Department of Justice investigators are looking into whether the Kushner-led Trump campaign digital operation assisted Russia’s attacks on Clinton during the 2016 election cycle. Though Veselnitskaya told NBC News that Kushner “left the meeting after seven to 10 minutes of the 20- to 30-minute meeting,” these incidents — with the Trump Jr. meeting now at center stage — have led to calls for Kushner to be stripped of the clearance. “Jared should, at a minimum, have his clearances rescinded making his utility as an advisor, which itself is suspect, impractical,” he continued. The email disclosure revealed that Kushner was copied on Trump Jr.’s email chain with Rob Goldstone, a British music publicist who represented a Russian pop star with ties to President Donald Trump and was tasked with arranging the June meeting. The email chain was titled “Russia — Clinton — private and confidential” and said a Russian official had “offered to provide the Trump campaign with some official documents and information that would incriminate Hillary and her dealings with Russia and would be very useful to” Trump. The fact that Kushner had the email chain available to him seemed to contradict an earlier statement from Trump Jr., who said over the weekend that Kushner and Manafort were told “nothing of the substance” of the meeting when he asked them to attend. “Mr. Kushner’s decision to take this meeting raises significant questions about his judgment and his respect for the very principles that our democracy was founded on — that our elections should be sacred and free of interference from a foreign adversary,” Rep. Elijah Cummings, the ranking Democratic member of the House oversight committee, told Business Insider in an email.